Sajeed (not his real name), a development worker in Kandahar city, describes the challenges of daily life in the Taliban stronghold. The Taliban limit their operations in the winter and some aid activities resume - along with the hope that the new year will bring a new beginning. 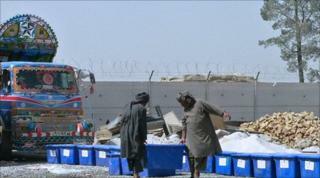 "After a long time people in Kandahar city are feeling relatively safe. There haven't been any major security incidents. You can see more people busy with various social activities. I know people who left for Kabul a while ago fleeing an anticipated military offensive - they've returned to their homes. The areas in the city known to have a permanent presence of insurgents seem to be clear of them now - only rarely are they seen patrolling them. This is not because they've been defeated by the coalition forces. Insurgents usually withdraw during the cold season and limit their operations while of course constantly looking out for any opportunities to create instability. In the meantime, development activities have almost restarted. Donor agencies were waiting for the US to announce the deadline for withdrawal of troops. Now that they know that's going to be in 2014, they are more confident about running long-term projects. But people here believe that this is not a real deadline. They don't expect the US to withdraw its forces so quickly. They believe that US forces will be here for some time to come, just like in Iraq and other places. And our government is not in a position to take over control of the country. The insurgents have strong positions and the government is not strong enough to deal with them. People in Kandahar were not optimistic that the recent parliamentary election would bring any real change. Yet the results still managed to shock: the preliminary result and the final one were totally different. Just an example - in the preliminary results Hashmath Karzai, a cousin of President Karzai, had 37,000 votes with the expectation to reach 45,000 after counting all votes. There is a general feeling of disillusion among Pashtuns. They feel that they have been abandoned by the government. They are not interested in joining the insurgency at the moment because they are tired of the militants' bare offensives leaving Pashtuns as the main victims. The government and international aid agencies argue that because of the bad security in the areas with Pashtun population, they can't do the work required. But Pashtuns believe they are the victims of ethnic discrimination. That's why fewer and fewer Pashto people are interested in the government. Last week there was a peace conference in Kandahar city led by [former president] Rabbani. Most participants were high-ranking government officials. We haven't seen anyone who represents the common people. Not a single common person had the chance to have their voice heard. Those who were giving speeches were sending out their messages for militants to join the government without giving them any reasons why they should do so, without making a real effort to convince them. There was high security and the most embarrassing thing was that the majority of the people didn't even know why the roads were blocked by the army. Why did these high-level representatives come all the way to Kandahar if local people were only going to see them through TV channels from Kabul? The result of this peace conference is not going to be peace. It ended without a footprint. Wouldn't it have been better, instead of condemning the insurgents, to listen to them for once? Make them feel that their voice is heard? It was a golden opportunity to invite them to the peace conference or invite them to at least send their messages. It's been a year of bloodshed in Kandahar. People suffered bombardment, road-side bombs, suicide attacks. Development activities are not even worth mentioning - aid workers are always under threat and have to keep a low profile around here. There are no security problems in northern Afghanistan, so people there can worry about food, electricity and jobs. In the south, our main problem is security. So people here hope to receive more attention from the government, they hope to be given new development opportunities in the new year. This hope is the only thing they have left."